Violet churcu is a native of the mountainous regions of Ecuador, but has become widely cultivated throughout the world, due to its beautiful violet flowers. A member of the nightshade family, Solanaceae, all parts of this species are poisonous, and it should not be ingested. Even handling the plant can cause skin irritation. For that reason it is recommended that gloves be worn when working with this species. 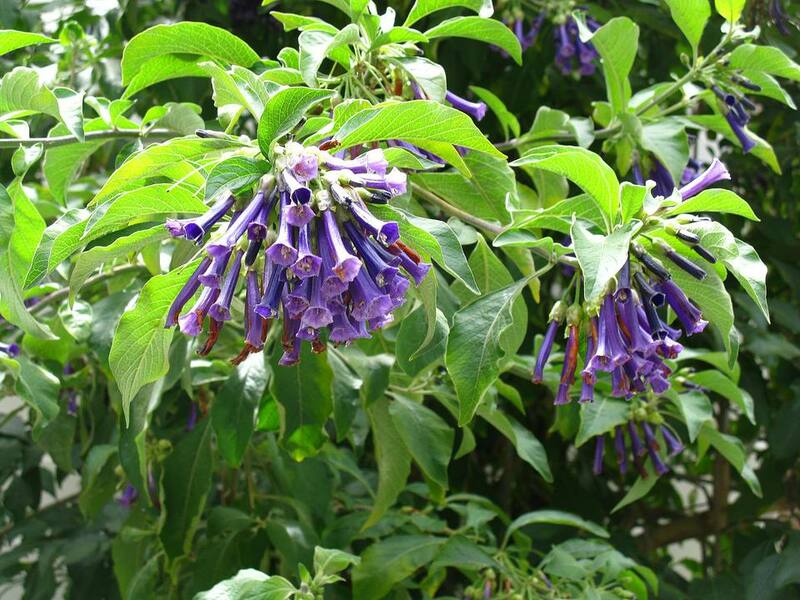 The scientific name given to this species is Iochroma cyaneum, a name that is derived from the Greek word for purple flower. Known by the common name of violet churcu, this species is also called royal purple, royal purple queen, sorcerer’s tree and violet tubeflower. It is also sometimes referred to as a mini brug because it not only resembles, but is a close relative of Brugmansias like angel's trumpet. Violet churcu is recommended for USDA Zones 9-11 but has been successfully grown in Zone 8and even protected areas of Zone 7. Because it is highly susceptible to frost, it should only be grown as an annual in areas that are subject to freezing winter temperatures. It can also be grown in a container and moved indoors during the winter months. This beautiful plant grows in the form of a shrub with large velvety leaves. The violet churu will grow up to eight feet high if allowed to grow over a period of years without being cut back. This species enjoys sun and should be planted in a location where it will receive full sun. If located in a region where summers are particularly hot, choose a location that has afternoon shade. Violet churcu should not be planted where they are subjected to high winds. Violet churcu has large velvety gray-green leaves that grow up to a half a foot long. The flowers are what grab everyone’s attention. They bloom all year, but are most intense in the spring and again in the fall. The blooms are a slender trumpet shape and are arranged in clusters of up to 30 blossoms. The flowers are typically deep violet, but there are cultivars of various shades ranging from blue to wine in color. Fruit of the violet churcu is in the form of a globose berry that contains many small seeds. For obvious reasons, this plant is primarily grown as an ornamental. It may be used as a background planting or as a shrub border. They pair especially well with any type of yellow flowering plant. Another popular use for violet churcu is in containers, which may be brought inside during the winter months. This makes it possible for those in northern locations to enjoy this plant. Last, but not least, this species is an excellent choice for hummingbird gardens. Wherever planted this species should be placed where it can receive plenty of direct sun. If located in very hot climates, provide some afternoon shade to abate the heat. It should be watered regularly and the spoil should not be allowed to completely dry out between watering. However, it is important to not subject the plant to standing water since it does not like wet feet. Plants grown in containers should be given fertilizer every two weeks, while plants used in landscaping should be given a slow release fertilizer on a monthly basis. Take care to avoid handling this plant with your bare hands, as it can cause skin irritation. This species requires little maintenance. Young plants should be only lightly pruned until well established. Established plants should be pruned back hard in the fall after flowering is completed. Some experts advise pruning all the way to ground level to promote robust blossoming the next season. Light pruning may be performed at any time to achieve the desired shape. Violet churcu has very few diseases or pests. They are susceptible to tobacco and tomato hornworms as well as tobacco mosaic virus (TMV). Because of the threat of TMV, it is recommended that those who use tobacco should not propagate the plants.